All external resource providers are added using a single window that adapts to your input. You must add the resource provider before you can use the resources it provides in your Red Hat Enterprise Virtualization environment. 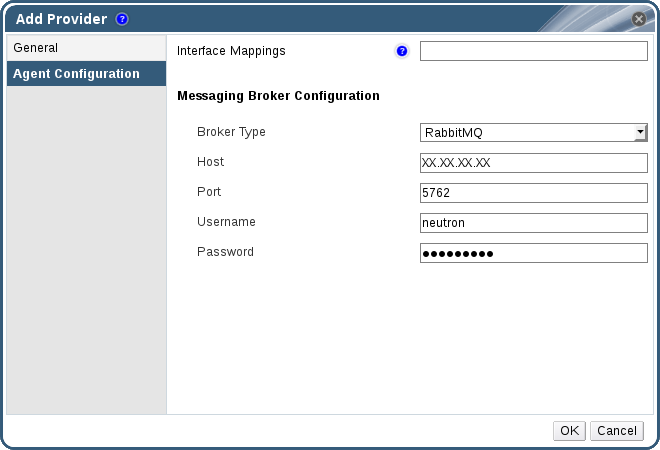 Add a Satellite instance for host provisioning to the Red Hat Enterprise Virtualization Manager. Red Hat Enterprise Virtualization 3.6 and onwards is supported with Red Hat Satellite 6.1. Click Add to open the Add Provider window. 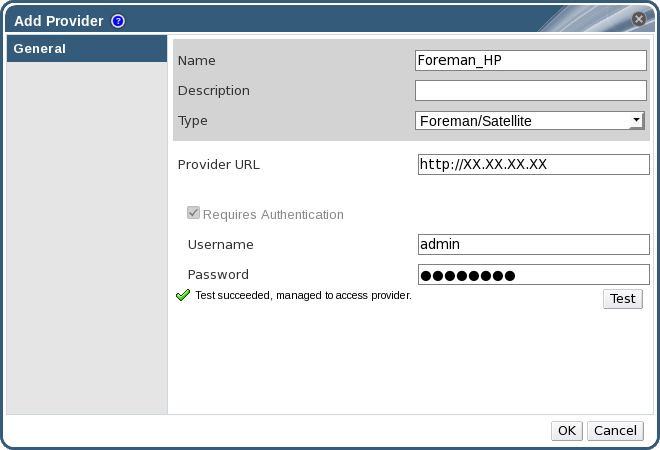 From the Type list, ensure that Foreman/Satellite is selected. If the Satellite instance uses SSL, the Import provider certificates window opens; click OK to import the certificate that the Satellite instance provides. You must import the certificate that the Satellite instance provides to ensure the Manager can communicate with the instance. You have added the Satellite instance to the Red Hat Enterprise Virtualization Manager, and can work with the hosts it provides. 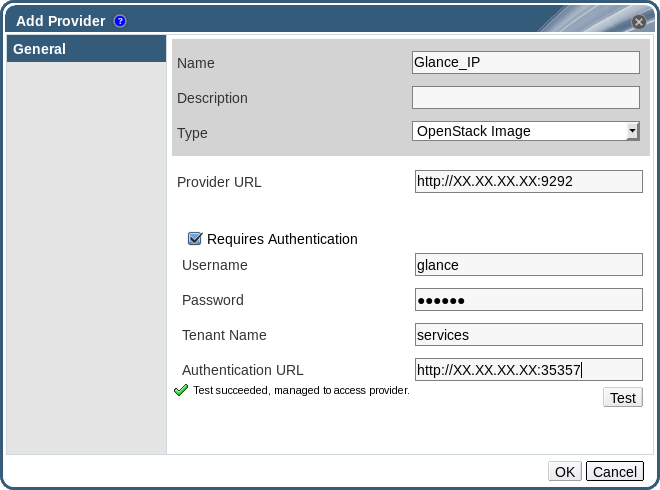 Add an OpenStack Image (Glance) instance for image management to the Red Hat Enterprise Virtualization Manager. From the Type list, select OpenStack Image. Optionally, select the Requires Authentication check box and enter the Username, Password, Tenant Name, and Authentication URL for the OpenStack Image instance. You must use the user name and password for the OpenStack Image user registered in Keystone, the tenant of which the OpenStack Image instance is a member, and the URL and port of the Keystone server. If the OpenStack Image instance uses SSL, the Import provider certificates window opens; click OK to import the certificate that the OpenStack Image instance provides. You must import the certificate that the OpenStack Image instance provides to ensure the Manager can communicate with the instance. You have added the OpenStack Image instance to the Red Hat Enterprise Virtualization Manager, and can work with the images it provides. 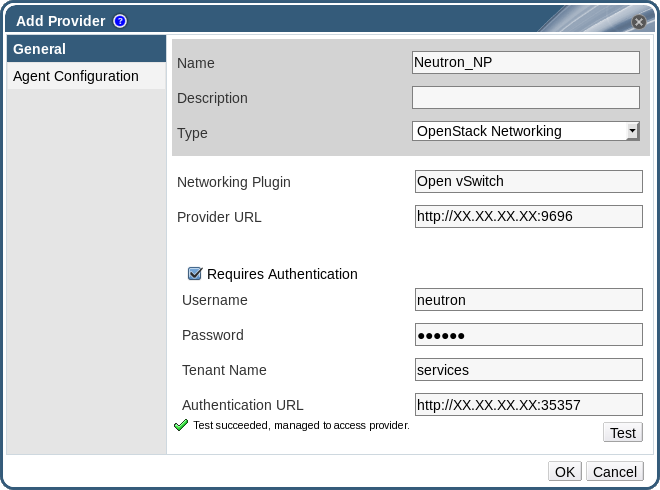 Add an OpenStack Networking (Neutron) instance for network provisioning to the Red Hat Enterprise Virtualization Manager. From the Type list, select OpenStack Networking. Enter the URL or fully qualified domain name of the machine on which the OpenStack Networking instance is installed in the Provider URL text field, followed by the port number. Optionally, select the Requires Authentication check box and enter the Username, Password, Tenant Name, and Authentication URL for the OpenStack Networking instance. You must use the user name and password for the OpenStack Networking user registered in Keystone, the tenant of which the OpenStack Networking instance is a member, and the URL and port of the Keystone server. If the OpenStack Networking instance uses SSL, the Import provider certificates window opens; click OK to import the certificate that the OpenStack Networking instance provides. You must import the certificate that the OpenStack Networking instance provides to ensure the Manager can communicate with the instance. You have added the OpenStack Networking instance to the Red Hat Enterprise Virtualization Manager, and can use the networks it provides. 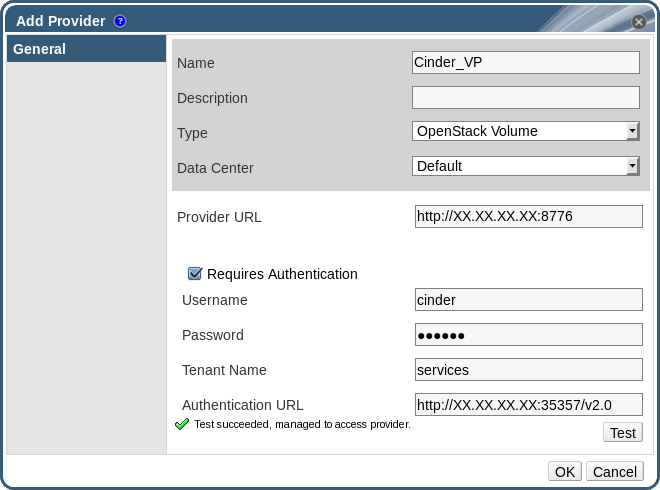 Add an OpenStack Volume (Cinder) instance for storage management to the Red Hat Enterprise Virtualization Manager. The OpenStack Cinder volumes are provisioned by Ceph Storage. From the Type list, select OpenStack Volume. Select the Data Center to which OpenStack Volume storage volumes will be attached. Enter the URL or fully qualified domain name of the machine on which the OpenStack Volume instance is installed, followed by the port number, in the Provider URL text field. Optionally, select the Requires Authentication check box and enter the Username, Password, Tenant Name, and Authentication URL for the OpenStack Volume instance. You must use the user name and password for the OpenStack Volume user registered in Keystone, the tenant of which the OpenStack Volume instance is a member, and the URL, port, and API version of the Keystone server. Click Test to test whether you can authenticate successfully with the OpenStack Volume instance using the provided credentials. On your Ceph server, create a new secret key for the client.cinder user using the ceph auth get-or-create command. See Cephx Config Reference for more information on cephx, and Managing Users for more information on creating keys for new users. If a key already exists for the client.cinder user, retrieve it using the same command. In the Administration Portal, select the newly-created Cinder external provider from the Providers list. Click the Authentication Keys sub-tab. Copy the automatically-generated UUID, or enter an existing UUID in the text field. You have added the OpenStack Volume instance to the Red Hat Enterprise Virtualization Manager, and can work with the storage volumes it provides. See Section 10.6.1, “Creating Floating Virtual Disks” for more information about creating a OpenStack Volume (Cinder) disk. 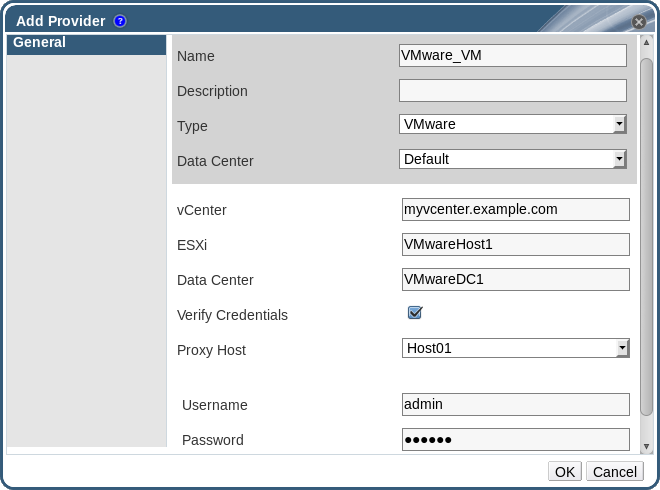 Add a VMware vCenter instance to import virtual machines from VMware to the Red Hat Enterprise Virtualization Manager. Red Hat Enterprise Virtualization uses V2V to convert VMware virtual machines to the correct format before they are imported. You must install the virt-v2v package on a least one Red Hat Enterprise Linux 7.2 host in a data center with version 3.6 compatibility. This package is available in the base rhel-7-server-rpms repository. From the Type list, select VMware. Select the Data Center into which VMware virtual machines will be imported, or select Any Data Center to instead specify the destination data center during individual import operations (using the Import function in the Virtual Machines tab). Optionally, select the Verify Credentials check box to verify the ESXi host's certificate. Select a host in the chosen data center with virt-v2v installed to serve as the Proxy Host during virtual machine import operations. This host must also be able to connect to the network of the VMware vCenter external provider. If you selected Any Data Center above, you cannot choose the host here, but instead can specify a host during individual import operations (using the Import function in the Virtual Machines tab). If the VMware vCenter instance uses SSL, the Import provider certificates window opens; click OK to import the certificate that the VMware vCenter instance provides. You must import the certificate that the VMware vCenter instance provides to ensure the Manager can communicate with the instance. You have added the VMware vCenter instance to the Red Hat Enterprise Virtualization Manager, and can import the virtual machines it provides. See Importing a Virtual Machine from a VMware Provider for more information. Username: A user name for connecting to the Satellite instance. This user name must be the user name used to log in to the provisioning portal on the Satellite instance. By default, this user name is admin. Username: A user name for connecting to the OpenStack Image service. This user name must be the user name for the OpenStack Image service registered in the Keystone instance of which the OpenStack Image service is a member. By default, this user name is glance. Tenant Name: The name of the OpenStack tenant of which the OpenStack Image service is a member. By default, this is services. Authentication URL: The URL and port of the Keystone server with which the OpenStack Image service authenticates. Networking Plugin: The networking plugin with which to connect to the OpenStack Networking server. Open vSwitch is the only option, and is selected by default. Username: A user name for connecting to the OpenStack Networking instance. This user name must be the user name for OpenStack Networking registered in the Keystone instance of which the OpenStack Networking instance is a member. By default, this user name is neutron. Tenant Name: The name of the OpenStack tenant of which the OpenStack Networking instance is a member. By default, this is services. Authentication URL: The URL and port of the Keystone server with which the OpenStack Networking instance authenticates. Username: A user name for connecting to the OpenStack Volume instance. This user name must be the user name for OpenStack Volume registered in the Keystone instance of which the OpenStack Volume instance is a member. By default, this user name is cinder. Tenant Name: The name of the OpenStack tenant of which the OpenStack Volume instance is a member. By default, this is services. Authentication URL: The URL and port of the Keystone server with which the OpenStack Volume instance authenticates. Data Center: Specify the data center into which VMware virtual machines will be imported, or select Any Data Center to instead specify the destination data center during individual import operations (using the Import function in the Virtual Machines tab). Verify Credentials: Specify whether the ESXi host's certificate will be verified on connection. Proxy Host: Select a host in the chosen data center with virt-v2v installed to serve as the host during virtual machine import operations. This host must also be able to connect to the network of the VMware vCenter external provider. If you selected Any Data Center, you cannot choose the host here, but instead can specify a host during individual import operations (using the Import function in the Virtual Machines tab).